Since I'm still trying to figure out how to balance blogging/taking care of a newborn/running on 3 hours of sleep, it's time for a repost! My goal is to publish new, creative content consistently, but bear with me while I try to figure out this thing called motherhood! This post was my first ever 10 Barn Weddings post, and I still love each of these weddings! Y'all have a great weekend! Happy Friday, everyone! Before I begin yet another new blog series, I've got to take a moment to brag on the fabulous, wonderful, brilliant Barn at Twin Oaks team. See this little ribbon? Do y'all know what that means?! Well let me tell ya. It means Lesleigh and her team are a big, BIG deal in the world of weddings. When Southern Weddings thinks you're something special, you know you've made it. 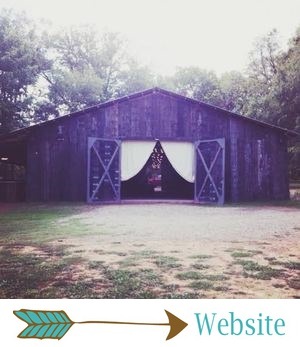 Head over to The Barn's page on Southern Weddings to learn a little bit about Lesleigh and see a few photos from some seriously stunning weddings at The Barn. Now back to that new series I was talking about. This one is called 10 Barn Weddings, and it's exactly what it sounds like. Every other week, I'll share 10 sneak peeks of weddings from The Barn that fit a certain theme, style or color. I'm starting this series on a high note with some glamorous weddings that are gonna knock your socks right off. In the words of Fergie, they are flossy, flossy. You may think that glam and barn don't go together, but by the end of this post, you'll realize that there is something truly special about a glamorous wedding inside a rustic barn. Anita and Wesley ended up having their wedding outside, but when this is your backup plan, you know you've picked a good place to tie the knot. You don't even need to see past Ashley and Ivan's altar to know how gorgeous and glamorous this wedding was. But go check it out anyway, because this one was really a stunner! So this one isn't actually a wedding, but how glam was The Barn's Winter Fantasy Styled Shoot from last year?! That cake is as fabulous as can be. Lauren and Jack's wedding last fall was elegant, chic and totally glamorous. How perfect is their altar?! I'm going to be totally honest here; Ani and Nathan's incredible wedding was the one that made me realize that The Barn was DEFINITELY the place for me to have my wedding. Pretty sure I emailed Lesleigh 2 seconds after seeing these pictures. ;) Really though, this wedding was mind blowing! Jana and Robert had the most beautiful November wedding, and I can't stop staring at her dress! That's as glamorous as it gets, folks. Once again, this isn't a wedding, but I couldn't keep from showing you a picture from the 2013 Formal Affairs Prom Campaign. My goodness! If it's wrong to show a picture from my own wedding, then I don't wanna be right. Our wedding was whimsical with a touch of glamour. These gold vases and our polka dotted place settings sure added some fabulosity to our wedding day! By the way, are y'all following us on Facebook, Instagram and Pinterest? If not, get to it, because we've got something BIG coming next week that you won't want to miss! I'll also be sharing two Barn Brides and their a-maaaazing weddings next week, so be sure to come check them out! Y'all have a great weekend, and I'll see you right here on Monday.